Tiny black ovals, Chia seeds are something of a dietary phenomenon. They come from the salvia hispanica plant, and they be eaten raw, ground, or added to dishes of all types. The seeds absorb a lot of water, swelling up to twelve times their size and changing from small individual seeds into gelatinous blobs. 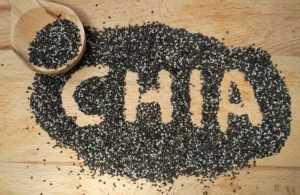 Chia seeds are high in protein and fat, making them an ideal addition to vegetarian and vegan lifestyles. 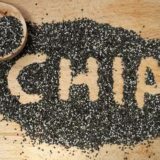 There are claims, as yet unverified, that chia seeds can work to improve heart health, especially cardio-vascular function. They are also high in fibre, and thus are a great addition to anyone’s diet. Samantha is always looking for ways to eat healthier and leapt at the chance of trying chia seeds – something that she had heard a lot about, but never actually quite summoned up the courage to try out. For her first time, she took the simplest step, sprinkling a couple of spoonfuls over her dinner. Chia is almost flavourless so the taste of her food was not altered in any way, but the seeds did add a gritty texture.She added chia seeds to her morning yoghurt, leaving it overnight to allow the seeds to absorb the moisture. Over the next week, Samantha tried chia in a variety of ways. She quickly began to tire of the changed texture of her food, but she did find that the extra fibre worked as promised and her digestive system worked – ahem – with greater efficiency, if not actual urgency! To try and not overdo it, Samantha settled on using chia seeds just twice a week to allow her to enjoy the benefits of the chia seeds without finding meals a trial. At £1.00 for 150g these chia seeds are more economical than others that can be found for up to £13.00 for 400g. It pays to shop around to make sure you find the best deal.